Retraite Artiste idyllique - sur l'océan - Promenade à la rose trémière !!! Situé au sein d'une courte distance de marche de la rose trémière Retreat Center sur la magnifique île de Cortes dans les îles Discovery de la Colombie-Britannique, cette cabane est une escapade idyllique pour un couple, artiste, écrivain, ou ceux qui cherchent la solitude et la retraite - donnant sur le détroit de Géorgie, Desolation Sound, et les sommets enneigés éloignées de la Colombie-Britannique. 5) Dormir loft avec lit queen - couette et les oreillers! Ardoise gris foncé. Double baignoire pour deux. Douche séparée. Immense baignoire pour deux personnes dans une salle de bains, douche séparée, bois sauna dans le jardin, vue imprenable sur Desolation Sound, distance de marche de la rose trémière. My wife and I spent a blissful 5 days here in late August. It was everything we could have wanted...real privacy, great view, charming inside with lots of artistic finishes, hot tub on the deck, short walk to Hollyhock. Look forward to staying again! Our jaws dropped the moment we pulled in. What a gem of a place, it just kept on giving. What a special place! Had there not been an active fire ban, we maybe would have never left. We will daydream of this trip for months to come. Thank you for making this cabin so cozy. Our only wish was to have slightly more time on our last morning before checkout, but everything else was perfect. Beautiful views, great cabin, and a great week of R&R. This is the second time I have stayed at this property. Much enjoyed my experience. Peaceful, spacious, so west coast....steps away is a plethora of blackberries and ocean views. Clean, quaint and welcoming. I highly recommend and look forward to staying at this property again. Perfect! Peaceful! Beautiful! Just what we needed. A bit of paradise. Recommend swimming in the lake and massages at Hollyhock. Just the sanctuary I needed. Every once in awhile you come across a place that feels so magical it's as though time stops and serenity begins. Ashley and Parker's cozy retreat is like that, only better. 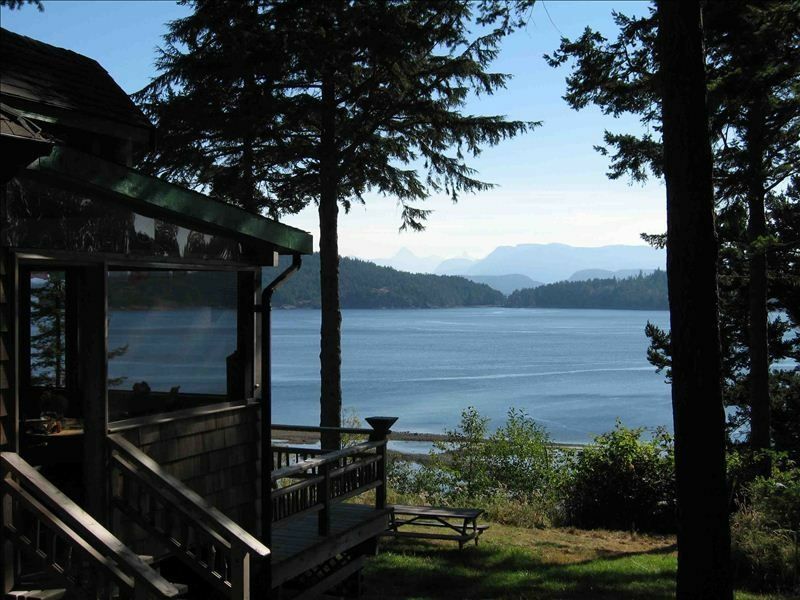 Ocean views, a wooden hot tub, wood fired sauna, 2 minutes from Hollyhock, trails abound, bikes to ride, and total privacy with one of the best views of Desolation Sound you could imagine. Seriously - can't wait to go back!! As is the case with all VRBO rentals - all bookings are made via credit card in U.S. DOLLARS.